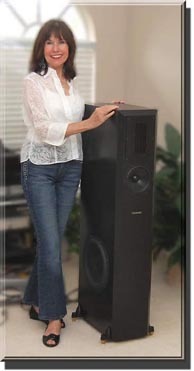 Last year we had the world’s first review of Coincident’s new Super Victory speaker at $9,995, pictured here with Linda - she's 5'8" for comparison. We were impressed. Very impressed. So much so that the speaker earned not only our rare Maximum Mojo Award, but also our Speaker of the Year for 2008. 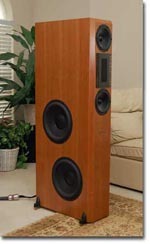 The speaker was not only sonically neutral with perhaps a slight lean to the warm side, it was also very linear and smooth from top to bottom; and the bottom was a low 26Hz making for a true full-range speaker. Not only did they go pretty low, but because the woofer was placed on the side of the cabinet, you have a choice of facing them on the insides or the outsides which can help adjust them to your particular room or ears. The soundstage was huge and detailed without getting overly etched or suffering from “playing in a laboratory” syndrome. Extremely musical presentation. Those qualities alone make the slim but deep towers very competitive with build quality pushing it even further ahead. But the real kicker is the fact that designer Israel Blume accomplished all that plus making the speaker efficient and sensitive enough to be driven to normal listening levels by as little as 5 watts. These speakers are about as amplifier friendly as it gets. They also worked well in a very small room – a real surprise. Other speakers abound that get one or two of these factors right, but full-range, musical, dynamic speakers that can be driven easily by SET amps are harder to find than fried pork chops at a vegetarian conference. The only qualifying factor in the Super Victory was their bass performance in a rather large open room with high ceilings and open walls. The single ten inchers were right on the verge of not pressurizing the 6,000 cubic feet or so area enough, we thought. They went plenty low, but for really big rooms they just need a little more air moving. On the other hand, they were the only floorstanding speaker that worked well - very well - in my small 12x12 foot, low-ceilinged listening room. All others overload the small space and did not image well at close range. In fact, they were the best sounding speaker in that room ever. Quite a feat. Enter the next model up in the Coincident line – The Total Victory IV. 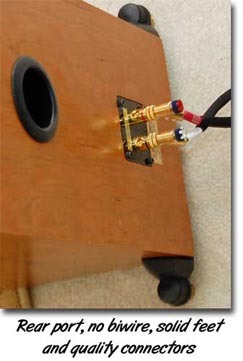 The Total Vic drops the single 10-inch, side-mounted woofers in favor of twin 12-inch drivers also located on the side for a little lower bottom of 22hz (more on that later), plus an additional midrange for a total of two in each cabinet placed in a classic D'Appolito design with the large ribbon tweeter placed between them vertically. The Nomex woofers are the same as those in the big daddy Total Reference. But this is far from five drivers stuck in a big, tall box. There’s a lot going on internally. Not only are the front 3 drivers contained within their own sub-enclosure, 3 computer designed, internal braces are used to ensure maximum rigidity. The two woofers are each placed within their own individual sub-enclosures containing two braces each. That stoutness helps keep cabinet resonance to a minimum and that, we have found, is a huge factor in clean, unsmeared details as well as listenabilty for long time periods. The Coincident’s not only allow you to listen to them for hours, they almost compel you to do so. The sound is so inviting and non-fatiguing, due in large part to the extreme care taken in things you never see inside the cabinets. The cabinet is, of course, taller, deeper and heavier than the Super Vic and also $5,500 more at $14,995. Like the Super, there are no speaker grills. You get your drivers naked! Enclosures are not constructed from the normal MDF found in the vast majority of speakers. Rather, they use 1" MDF Hardwood, a specially developed material that is both very rigid, non-resonant and highly uniform with regard to density, we were told. I asked Mr. Blume to explain: “MDF is medium density fiber board. This is fabricated out of medium soft wood trees and bonded under extreme high pressure with a mixture of adhesives. Within MDF there are varying grades. Some are less dense , others are more or less consistently dense. The higher the density and more consistent throughout the board, the more costly and superior the product. Coincident uses a type often referred to as Ranger board. 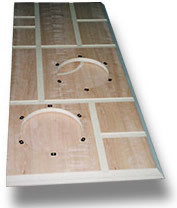 This board is the highest density and most consistent ( and costly being 2-3 times the price of regular MDF) and is made of medium soft and hard wood trees with a greater proportion of wood particle and less adhesive. Standard MDF boards have a density of 32 lbs/cc ft. Our boards have a density of 42 lbs/cc/ft and consistency throughout the board of 1% as opposed to 8%-10% for standard boards. Our MDF is actually almost 50% more rigid and 40% less resonant. This translates to a huge sonic difference. Our boards have hardwood veneer bonded to them on both sides with a special hard drying adhesive under extremely high heat and pressure. This ensures that the veneer will never peel or bubble not matter how humid or hot the conditions. The sonic benefit of the adhesive we use in addition to the double sided veneering is a furthering of the overall rigidity and non resonant quality for which we strive in all our enclosures." " We have experimented within MDF hardwood(which is made of mostly hardwood trees) but found that while they were very rigid, they were much more resonant between 40hz- 120hz. Good for furniture, less appealing in loudspeaker enclosures. It took me 4 years of experimenting and measuring numerous substances, from birch plywood to ceramic based materials to granite and mineral composites and pure hardwoods to settle on the MDF we eventually use exclusively because it proved to have the best balance between high rigidity and low resonance which accounts to a large degree for the transparent, neutral or unbox-like qualities of Coincident speakers." Coincident also employs CNC (Computer Numeric Control) construction to ensure machining accuracy to within .01 %. All speaker joints are manufactured using the “Spline Joint Construction” method to produce a very tight cabinet devoid of resonances. Furniture grade cherry wood is used that is veneered inside and out to eliminate any potential for the finish to peel or bubble. Elaborate computer designed bracing scheme which minimizes any cabinet flexing, which creates excessive storage and release of energy which results in audible distortions. Enclosure dimensions which help reduce internal standing waves. All Coincident enclosures are tuned to a very high fundamental resonance frequency of 350 hz, (as opposed to the 80 hz resonance of most speakers). According to Blume, this high frequency tuning technique renders resonances sonically benign and inaudible. The European drive units are manufactured specifically for Coincident and/or modified by Coincident for enhanced performance. All drivers are tested and matched to within .2 d b to ensure that all speakers match the reference, thereby eliminating any unit to unit variation. Coincident adheres to the belief that only superior drivers can produce superior sound, even though this is a much more costly path to follow. All drivers are highly sensitive, have uniform impedance characteristics AND possess high power handling capability for the utmost in reliability and sonic excellence. or deteriorate over time. Only one component is in the signal path for each driver. Specially developed Coincident 6N (6 nines or .999999 purity) copper cable is used for all internal wiring. All cable is hardwired to the drivers, crossovers, and 5-way binding posts which are gold plated, heavy duty, solid 3/8 " pure copper. Impedance is 10 ohms (always between 8 – 16 ohms) which was deliberately designed to present a very easy load to all amplifiers, but especially low-power tube amps such as 300B’s. The rated sensitivity is a very good 92.5 db -1 w @ 1m , but Israel makes a rather audacious claim that the minimum power requirement is a ridiculous five watts! In the same vein, he says they will handle a whopping 500 wpc. Is this guy nuts? When asked about his views on impedance matching, Blume told us, “The impedance modulus of the SV ranges between 6 - 16 ohms. There are no dips or peaks at any frequency. This is especially important in allowing a speaker to be easy to drive. Any huge swings in impedance, particularly those below 3 ohms will rob most amplifiers of their drive capability . This is especially relevant with tube amps that need higher impedances to more closely match with their output transformers. Also, tube amps are voltage as opposed to current devices. They therefore put out higher power into higher impedances. When a loudspeaker's impedance drops to below 2 ohms, (and this can occur at only a single or a few frequencies), it presents a virtual short circuit to almost all but the most high current, high power, solid state amps. Single ended tube and OTL amps have their power supplies literally sucked dry". For the most part, all of the outstanding qualities of the Speaker of the Year Super Vic were there; I was afraid there would actually be TOO much bass with the new pair of 12” woofs like some I’ve heard withthe same side mounts (like NHT’s), but I should have known better; Israel is too much of a perfectionist for that. The low end did not get Iouder and to be honest, I was not cognizant of it being much lower, no matter whether the woofers were facing inward or outward. But it was much firmer in the large room (I did not try these in the smaller 12x12), more solid and rock steady providing a much better foundation with very little change in the overall tonality. More impact I would say. It was more of how they felt than how they sounded if that makes sense. But the fatty bloatiness and/or “boom-boom” you often get with multiple woofers (or actually subwoofers in this case) is nowhere to heard. There was, for me at least, a slight trade-off from the smaller Super Vic and that was in terms of bass speed – quickness, responsiveness. The big twins were just a tad slower. Don’t get me wrong; if you listen to these with a recording of a loud, close-mic’d tympani roll, you will not find yourself thinking, “Ewwww! These are sloooow!” Not at all. And believe me, those “Ewww” speakers are out there. You would probably not notice it at all unless you were making a direct comparison as am I here. But it was noticeable, if I listened very intensely on close mic’d kick drums with busy patterns and some electric bass lines. WOuld that keep me from buying these? No way. These speakers are so musical and intoxicating throught the frequency spectrum and overall speed that the one small very critical observation in a virtually flawless presentation. I would not recommend use of a 5 wpc channel amp with these in a large open room though unless you listen very moderately all the time. Think more like 10 to 15 if you have tubes or 40 for solid state, ballpark, even though the Total Vic is rated about 2 db more sensitive than its little brother at 95db @ 1m – 1 watt. Israel might argue that, but that’s my assessment. I really did not detect any significant difference in the mid and upper end overall character with the added midrange driver of the Total Vic. Like the award winner Super Vic however, these speakers are not only very revealing of the music you play, but also of the components in front of them. They have an amazing knack of not being overly analytical of music; actually rather forgiving in that regard, while still never lacking in detail, but laying bare any changes in amps, sources or cables. I used several amps and preamps with these speakers including Coicident’s own Dragon tube monoblocks and Statement Linestage as well as others such as Halcro, LSA, the AudioSpace Ref integrated and the 125 pound Ayon Triton tube integrated. And even the tiny Virtue Audio One Tripath integrated. I also have the prototype Sensation from Virtue, but I can’t talk about that yet. With the possible exception of the Sanders electrostats, I have never heard a speaker that acts more like a chameleon than Coincident speakers. Remember, that lizard does not change it’s body – it still has four legs, a head and tail, it adjusts its outside color to it’s environment. Coincident speakers do not change their outstanding character, but do reveal micro and macro differences in anything you place in the system. Perhaps that’s because of the minimalist crossover and the benign load they present to amplifiers, I can’t be sure, but I could swear all my amps grin broadly when I hook them up to Coincident speakers. I wish I still had the smaller Frankenstein monoblocks from Coincident that I used with the Super Vic’s. Those babies are something really special - extraordinary I dare say and it would have been better to do an apples to apples with them, but I was able to compare the speakers with other amps I used with both models so I am confident that I’ve gotten it right. 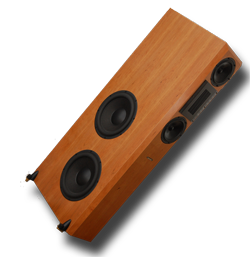 I have to add that the gorgeous real wood cherry cabinetwork of these speakers showed off the ultra-high quality furniture grade craftmanship even more than the previous all-black models. Top shelf indeed. 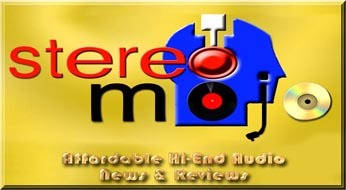 The Coincident Super Victory, the one we previously reviewed, got a rare Stereomojo rave review. We actually endeavor not to rave in our reviews. If you are looking for speakers, you should read that review because I left out some background and information in this one to avoid duplication. You might learn something about speaker efficiency and impedance you didn’t know – and need to. 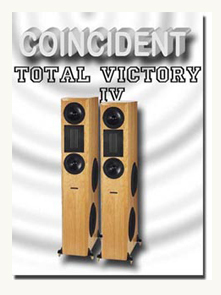 Are the larger Total Victory IV’s worth the extra $5,500? If you have a very large, spacious, open, carpeted or well-damped room, the answer is a resounding yes. The IV’s simply move more air and better pressurize large spaces with essentially the same outstanding sonic attributes. Even at their size, they can easily be driven by small output amplifiers, especially tubes. That means you don't have to put more money into high power amps. Also, a lot of speakers tout themselves as "full range" when they really roll off at 40 Hz or even higher. These speakers are the real deal with a low end the precludes any thoughts of extra subwoofers. They go low when called upon, but never draw attention to that area. nothing will fatigue your ears and shorten your listening desire than over stated bass. I can't think of another speaker that made us want to listen to them for extended periods (hours) than these. For me, (and Israel probably won’t like this), even in the 6K cubic feet in my large listening room, I’d buy the smaller Super Vic’s, the Frankenstein monoblocks and the new Coincident Statement Linestage we just reviewed. For about $20k, you’d have a system that takes a back seat to nothing in terms of pure musically and supreme satisfaction. You could spend that much and more on a pair of speakers alone and not do nearly as well. That is a system system you can’t wait to get home to and listen for hours. And whether that is “super” or “total”, it’s a big victory in anybody’s book.